You Can Call Me Hoppa! 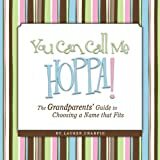 The Grandparents' Guide to Choosing a Name that Fits is a collection of grandparent names and stories designed to assist modern grandparents in finding the answer to the 'what to be called?' question. Think baby name book for Boomers! We hope that you enjoy perusing the pages of possibilities, whether you are a first-time grandparent, one who is relatively established or a step-grandparent. Most of us are given a name at birth and don't again get the opportunity to choose a name that truly represents who we are until we reach grandparenthood. The names and stories in this book include traditional titles, cultural appellations and names that are perfectly personal. But the most captivating collection of monikers is found in the Out of the Mouths of Babes section. The name that is right for you may not be contained within the pages of this book, but we hope that we can provide you with the inspiration you need to choose a name that fits! This revolutionary baby-name book presents personality profiles for 1500 names, so parents will understand what images people associate with each . . . before they pick one. Baby name expert Jeffarious Shanderrick Williams gives parents and sports fans alike the definitive book on how to successfully name their baby boy for superstardom. Culled from rosters around the world, Superstar Names goes beyond the simplistic and all-too-common names that exist today. Instead he highlights over 2,100 proven and unique names that all but guarantee a child for success on the playing field. Providing a guideline for parents unlike any other baby name book, Superstar Names explains how to invoke true creativity with helpful hints, statistical facts, astrological advice and true-life examples. For parents looking to steer their son to his sport of destiny and to capitalize on his athletic prowess, Jeffy S. Williams has come to the rescue. Superstar Names is the baby name book for the 21st century sports fan. This is the most Unique Baby name book on the market today. It also includes Pregnancy Journal with a place for notes, Belly pics & Baby pics to record as you and your baby grow month to month. The cover comes in a mixture of soft baby colors that appears to look like a pre-wrapped gift. It has over 17,000 incredible names some conventional & some never before heard of.Here's just a few of my favorites: Season,Story,Salem,Sunrae,Promise,Zoey,Secret,Summit,Lyric, Willow, Dalton,Kai Lea, Makana,Yardley, Carpenter,Journey,Riley,Carver,Banks,Lassen,Reason,Crescent,Lanai,Striet,DeNe',Treasure and Only. These are just a tiny sample of whats waiting inside. Need the lowdown on first names? Linda Rosenkrantz and Pamela Redmond Satran, authors of the bestselling Beyond Jennifer & Jason, Madison & Montana and The Last Word on First Names, offer a fresh, illuminating, and indispensable guide to thousands of names from Aaliyah to Zuri. * Call your daughter Rose, but don't call your son Thorne. * Word names, nature names, and what might be called time names are fashionable now, especially those that haven't been used much in the past. December, in other words, is much cooler than April or June. * Although it sounds desertlike, Zahara is actually a Muslim and Swahili name meaning "flower." In Hebrew, it denotes brightness. * If Cook and Sailor can be used as first names, why not Fisher? * Though it has a hippyish feel, Jupiter has a legitimate history as a first name, used in this country as far back as the eighteenth century-- in fact, Jupiter Hammon was the first African-American poet published here. * Malcolm's in the middle-- of a definite revival. Whether you already have a list of favorite names or are just beginning to look for ideas, Baby Names Now will provide the information and inspiration you need to make the perfect choice. What will you find in this book? • An Indian name for your child • Its precise Hindi or Sanskrit meaning. • The name written in Devanagari script to tell you its correct pronunciation. • Indications on which names to beware of because they can be mispronounced/misinterpreted. • A selection of our favourite names if you want to search a smaller list. • Alphabetic listing of names for girls (pink pages) and for boys (blue pages) ordered by the number of letters in the name. • A guide to naming your child by her/his rashi or birth constellation.